President Obama receives low marks for his handling of the situation in Iraq: just 37 percent approve, and 52 percent disapprove. While most Democrats approve, nearly a third of them disapproves. Moreover, more than two-thirds of Americans do not think Mr. Obama has clearly explained what the U.S. goals are in Iraq. Among members of his own party, more say the president hasn't explained U.S. goals than say he has. Looking back, most didn't think George W. Bush's administration clearly explained U.S. goals in Iraq either. Forty-one percent of Americans think Mr. Obama's response to the violence in Iraq has been about right, but 29 percent think he should be doing more (including a majority of Republicans), and 22 percent think he should be doing less. Among those who disapprove of Mr. Obama's handling of Iraq, 47 percent think he should be doing more, while 33 percent think he should be doing less. And the president's overall job approval rating has dropped slightly in the wake of the violence in Iraq and the repatriation of Sergeant Bowe Bergdahl. Forty percent now approve of the job he is doing as president, down three points from May. Fifty-four percent now disapprove. Among Democrats, the president receives a 70 percent approval rating, down from 76 percent in May. His disapproval rating among that group has risen nine points. The president's ratings on the economy and foreign policy remain more negative than positive. 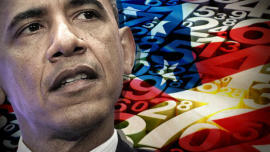 54 percent disapprove of his handling of the economy. Fifty-eight percent disapprove of his handling of foreign policy - the first time a majority has disapproved of his handling of this issue. He fares poorly on terrorism as well: 36 percent now say the policies of the Obama Administration have made the U.S. less safe from terrorism - a high mark for CBS News/New York Times Polls. Just 29 percent of Americans think the administration's policies have made the country safer from terrorism. There are political differences. Most Republicans (65 percent) think the Obama Administration's policies have made the U.S. less safe, while Democrats (50 percent) are more inclined to think they have made the U.S. safer. More than four months before the Congressional elections, less than one in four voters say they are very enthusiastic about voting in November, and another 37% are somewhat enthusiastic. Republicans are more enthused than Democrats. Democrats now have a small three-point lead among all registered voters in the national measure for November's congressional vote (42 to 39 percent). But among voters who are paying a lot of attention to the 2014 campaign, Republicans have the edge, 48 to 43 percent. National polls are imperfect predictors of the November vote for individual House races. Two-thirds of voters are paying at least some attention to the campaign, including just 28 percent who are paying a lot of attention. Congressional approval is now at 14 percent; 78 percent disapprove. This poll was conducted by telephone June 20-22, 2014 among 1,009 adults nationwide. Data collection was conducted on behalf of CBS News and The New York Times by SSRS of Media, PA. Phone numbers were dialed from samples of both standard land-line and cell phones. The error due to sampling for results based on the entire sample could be plus or minus three percentage points. The error for subgroups may be higher Results based on the sample of veterans is plus or minus eight points. Interviews were conducted in English and Spanish. This poll release conforms to the Standards of Disclosure of the National Council on Public Polls.